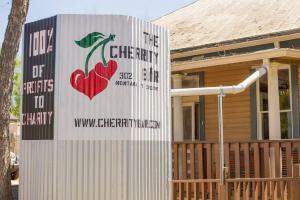 The Cherrity Bar is located at 302 Montana St., near the Alamodome. San Antonio Nerd Night is expanding to a third regular gaming event on the first Thursday of every month at The Cherrity Bar, located at 302 Montana Street. SAN ANTONIO, TX, USA, July 5, 2018 /EINPresswire.com/ -- San Antonio Nerd Night is pleased to announce a third regular charity gaming event to be hosted on the first Thursday of every month at The Cherrity Bar, located at 302 Montana Street. The Cherrity Bar’s Nerd Night will run from 7pm until 11pm every first Thursday of the month, beginning on August 2, 2018. The inaugural event will benefit San Antonio Pets Alive!, as will all of San Antonio Nerd Night’s August events. Donations of large size “kong” toys, peanut butter, and Cesar canned dog food are requested to help support SAPA!’s mission. San Antonio Nerd Night has partnered with several game companies including CMON, Asmodee North America, IELLO, Rio Grande Games, Blue Orange Games, Gamelyn Games, and Czech Games to assemble a resident game library for The Cherrity Bar, which will be available for patrons to use whenever The Cherrity Bar is open. The games have been carefully curated to be small-space friendly and easy to learn, while not sacrificing quality. Expect much more than just checkers and cards! All San Antonio Nerd Night events are free to attend, with donations encouraged. A guest speaker from San Antonio Pets Alive! will briefly address the group early in the evening on August 2nd to share details of organization’s work and how the community can support their mission through volunteer and giving opportunities. San Antonio Nerd Night offers open tabletop board gaming for all ages and interests, as well as a game library with welcoming people willing to teach their favorite games to others. Purchasing food and drink at The Cherrity Bar enables patrons to support additional nonprofits through The Cherrity Bar’s profit donation program. San Antonio Nerd Night is a 501(c)(3) public charity formed by tabletop gamers working together to improve their community by “Gaming for Good.” Game nights foster community, strengthen families and build relationships and friendships among the people who play together. San Antonio Nerd Night partners monthly with a San Antonio nonprofit or charity with a focus on helping the city’s vulnerable populations. Learn more about San Antonio Nerd Night at sanerdnight.org. The Cherrity Bar is a nonprofit restaurant and bar created for the purpose of supporting a diverse array of nonprofit charities. 10% of profit each month is donated to the Tourette Association of America, and the remaining profits are divided among three featured nonprofit charities. The three charities are chosen by the Friends of the Cherrity Bar, a diverse panel of volunteers that meets quarterly to review applications and select charities for each month of the upcoming quarter. Patrons who purchase a drink or spend at least $10 in food receive a token, which they may use to vote to determine first, second, and third place charities, and those organizations receive a 60/30/10% split on the remaining 90% of profits. Learn more about The Cherrity Bar at cherritybar.com. San Antonio Nerd Night, Inc.